"A summer/fall specialty, blending the flavors of garden fresh basil and juicy tomatoes. 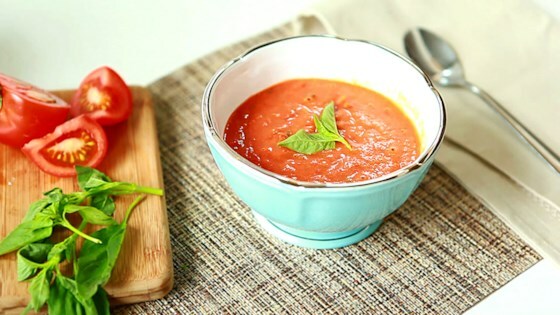 Make this soup when you are feeling tomato rich." Place the tomato halves, cut side up, on a baking tray with the garlic cloves. Drizzle with the oil, and sprinkle with salt and pepper. Roast at 375 degrees F (195 degrees C) for 1 hour. Snip the ends off the garlic cloves, and squeeze the insides into the bowl of a food processor along with the entire contents of the baking tray. Add stock, basil, and vinegar; blend until smooth. Season to taste. Serve either hot or cold. Roasting the tomatoes beforehand adds a delicious flavor to tomato soup! The adjective 'hearty' in the title of this recipe is a little misleading. Try 3x tomatoes or 1/3 broth. Excellent recipes. I would recommend adding the broth a bit at time instead of all at once. That way you can control how thick the soup is.